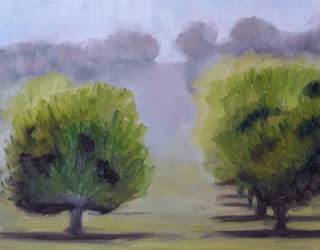 Today's painting is an 8x10 inch oil painting inspired by the early morning fog of an Eastern Washington State orchard. The sun hung just above the fog layer, cast shadows through the mist, and attempted to burn off the cool dampness of the morning. 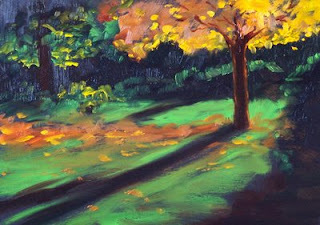 Painting the morning mood of this orchard was a pleasure. The heat of the afternoon is a different story. The paint on this rendition is dry and the painting can be purchased from Impressions Gallery at 1000 markets for $125.00 plus $12.50 shipping to US addresses. It is one of several in the Landscape Section of the gallery. Other Washington State Landscapes are also available. Hope you stop in for a visit. Today's painting is my interpretation of the most recent Different Strokes Challenge. It is a lovely reference for a hot summer day. 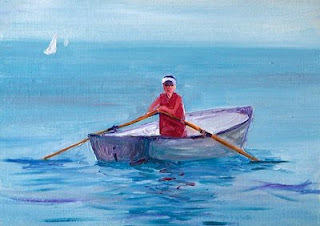 Don't we wish we could all be out rowing on the lake? The painting is 5x7 inches on a gessoed hardboard panel. The forests of the Olympic Peninsula are deep and rich. Hiking amongst the evergreens can provide a sense of wonder for those who meander amongst them. 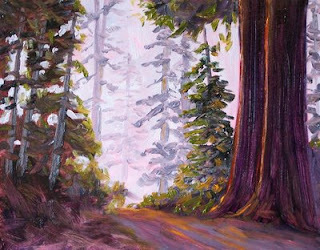 This 8x10 inch oil painting was inspired by one of my hikes in the Olympic National Forest. If you decide to visit, wear good shoes, take a jacket, and enjoy your visit. Today's 5x7 inch oil painting was an experiment. Though I've painted on black gessoed panels before, I've never attempted a sunset on a black panel. Traditionally sunsets are bright. A black undercoat prevents the reflection of light necessary for the brilliance a sunset might suggest. I tried it anyway. It isn't as colorful as a typical sunset, but it has an interesting quality that suggests the time just before sundown. A fun little experiment. The coast of Washington State is often blanketed in with banks of morning mist. Waking up to the damp ocean fog might seem disappointing to a visitor unfamiliar with coastal weather, but the damp haze usually clears by afternoon leaving a gorgeous day. 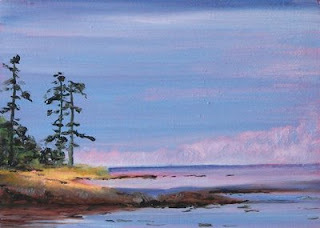 This little 5x7 inch oil painting documents a summer fog on Puget Sound in Washington State. When it dries, I will place it for sale at Small Impressions Painting on Etsy. Other small format paintings are for sale in the Small Impressions Gallery for $50.00 plus $6.50 for shipping to US addresses. Cape Flattery is located at the northwest tip of Washington State. It is the furthest point northwest in the contiguous states. Sea stacks, fog, and lots of greenery characterizes the area. A 20-30 minute hike will take visitors to breath-taking scenery. 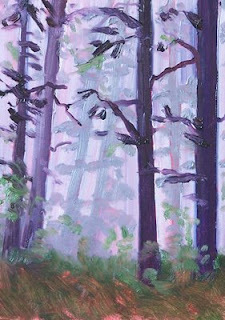 This painting is 8x10 inches and is part of my Northwest Fog series. When the paint dries, it will be listed for sale at Impressions Gallery at 1000 Markets. Once again I've been inspired by Northwest fog. The subtle light on the trees in the distance was good practice. I began with a red wash of napthol read, created a dark of alizarin crimson and ultramarine, then grayed it down to several values of lighter gray before painting the distant trees. The painting is 5x7 inches on a gessoed hardboard panel. It was for sale at Small Impressions Paintings on Etsy, but has now SOLD. Some of my other small landscape paintings are still available in the Landscape Section of the gallery. The paint has dried and I have listed this little 5x7 inch oil painting in my Etsy Gallery. It was created this past spring after having taken a walk on the Soundview Trail in Pierce County, Washington State. It was an early Saturday morning, the sun was trying to emerge, but a warm, spring fog hung close to the ground. It is for sale for $50.00 plus $6.50 for shipping to US addresses. 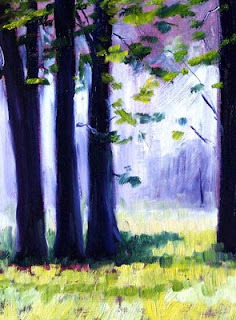 Additional small tree paintings are available for purchase in the Tree Section of the Small Impressions Gallery at Etsy. This little painting spent some time on the front page at Etsy this past spring, so while looking over the inventory at Small Impressions Gallery, I decided to bring it out of expiration and relist it at the gallery. 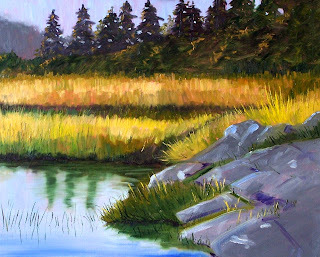 It was painted after a trip to the Nisqually Delta in Washington State. These little trees struggle to share their beauty in the middle of a saltwater estuary and their efforts are definitely appreciated. The painting is a 5x7 inch oil painting on a gessoed hardboard panel. It can be purchased for $50.00 plus $6.50 for shipping to US addresses. 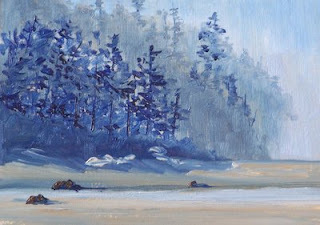 Today's little 5x7 inch painting is the shoreline on the Washington State side of the Strait of Juan de Fuca. The strait runs inland from the Pacific Ocean and joins Puget Sound. Vancouver, British Columbia is to the North. This particular scene is looking west toward the ocean. When I was in my early teens I spent many summers in this part of the state working with my father who ran a commercial fishing operation. It was a lovely way to spend a few summers --fresh air, mist, and early morning wake ups. We've had 29 days with no rain, but the rain emerged today and ended the stretch of early summer sunshine. At first the return of our usual gray Northwest weather left me feeling a bit uninspired, but I forced myself into the studio. 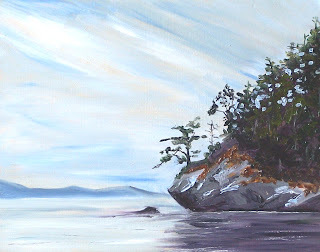 The result is this painting of a rocky island in the San Juan group between Washington State and British Columbia. 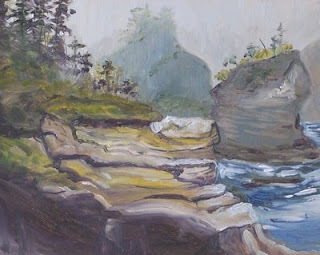 I don't really know the name of this rocky little protrusion, but I feel this 8x10 inch painting captured the scene well--the overcast, rocky roughness of the land and sea. If you haven't had a chance to cruise through the San Juan Islands, take the opportunity. It is full of sea lions, Orca Whales, and a host of other wildlife that should not be missed. And sometimes we have a stretch of 29 days without rain! Lately I've been putting in some time on a few larger paintings in consideration of an upcoming local competition. This 16x20 inch painting is one of several I've been dabbing at. The show is in July and I am limited to two paintings. I'd rather enter a couple of larger paintings rather than some of my small works. Larger painting have more impact in a competition. I have several 16x20 inch frames on hand that are in very good condition, so framing expense won't be an issue. Recently I've been working on a larger painting, so I don't have anything new to post except for my latest listing at Small Impressions Gallery at Etsy. This little 5x7 inch landscape oil painting was painted on a black gessoed hardboard panel. I like the effect created by the dark underpainting. It can be purchased for $50.00 plus $6.50 for shipping to US addresses at Etsy. 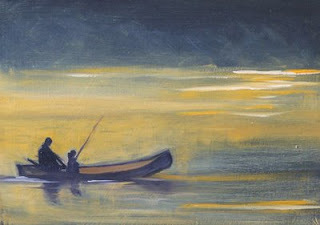 A companion painting, Evening Light, of the same size and color range is also available. The studio move is finally coming to an end and I was able to get some painting in this morning. 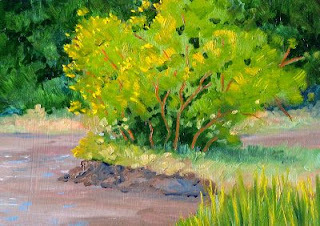 This 8x10 inch oil painting is from the Different Strokes Bi-weekly challenge and was fast and fun to paint. I really focused on painting shapes and colors, not objects. Although there are a few nit-picks I could grouse about, I'm going to leave it as is. 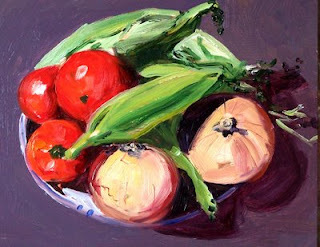 When it dries I will probably add it to my other still life paintings at Impressions Gallery at 1000 Markets. My 8x10 oil paintings are currently selling for $125.00 plus $12.50 for shipping to US addresses. So far the month of June has been crazy with family obligations, end of the school year challenges, and moving my studio. My painting schedule has been compromised and I'm living in the midst of disarray. Stealing a few minutes tonight to post a new listing to my Etsy Gallery feels wonderful. 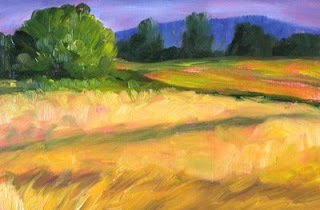 This little 5x7 inch study is a painting I completed in preparation for a 9x12 landscape on stretched canvas. I painted several versions of this scene using different palletes, underpaintings, and design elements. Today this one is for sale in my Etsy Gallery for $50.00 plus $6.50 for shipping to US addresses. The 9x12 painting is more intense and leans towards abstraction. It is for sale at Impressions Gallery for $175.00 plus $12.50 for shipping to US addresses. I'm looking forward to getting back to my regular schedule of painting and posting next week. Today's painting is a 5x7 inch oil painting on a gessoed hardboard panel. 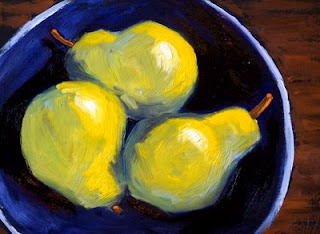 The lighting suggests a summer evening when shadows fall and the color on this painting of yellow pears is soft and soothing. At Small Impressions Gallery this painting can be purchased for $50.00 plus $6.50 for shipping to US addresses.